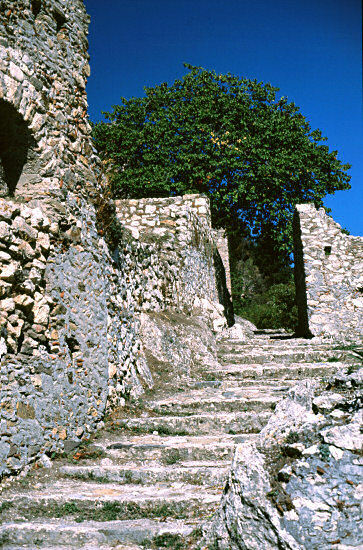 The archaeological site of Mystras is vast and one should devote at least several hours (better: a full day) to exploring it. Getting there involves a steep climb but the effort is rewarded by many beautiful views and, of course, the wonderful byzantinic architecture including a castle, several important churches, palaces, convents a museum and some normal houses. I especially enjoyed the scenic layout and the many overgrown paths, old stairs and dorrways. Like with many transcribed places names, quite a confusion exists concerning the spelling of the Greek place name ??????? in our alphabet: Mystras, Mystra, Mistra, Mistras.